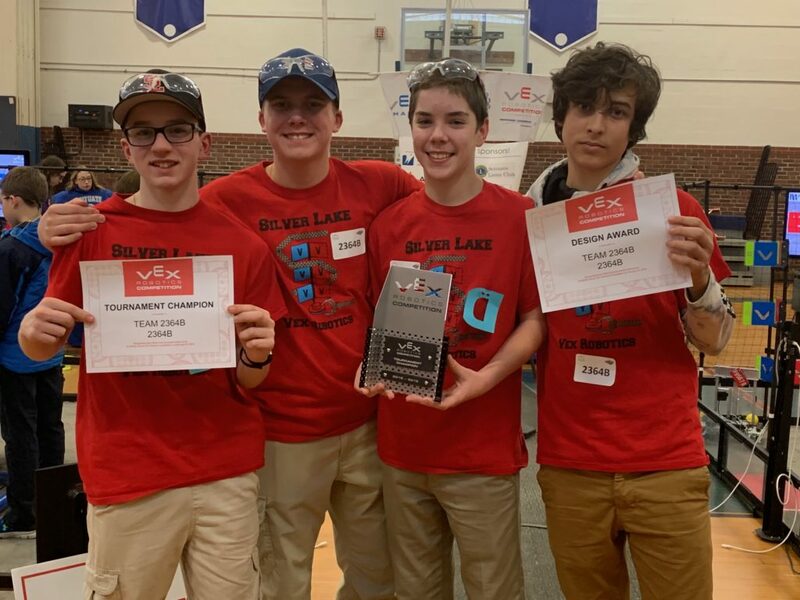 Silver Lake Middle School VEX Robotics Club is accepting congratulations on their recent victory at the New England VEX Qualifying Competition, Turning Point, held Saturday, Feb. 2 in North Scituate, Rhode Island. Team B from Silver Lake, after a grueling day of matches, won the tournament! This is the first time a team from Silver Lake has accomplished that feat. In addition, they also won the design award. Robotics is big at Silver Lake. There are two after school robotics clubs: VEX Robotics and LEGO Robotics. The VEX Club builds robots using VEX parts, and VEX sponsors the competition. The Silver Lake VEX Robotics Club has four teams of students who competed in the Turning Point qualifying competition. Of the four, Team 2364B will advance to the New England Regional Championship Feb. 23, at the Walsh Middle School in Framingham. Team B members are JD Keegan, Max Colombo, Wes Hawley, Sami Areski, Gavin McKenna, and Dylan Whittemore. The “Turning Point” competition began with nine ranking qualifying matches for each team. Once the teams were ranked by how many points they scored, the top teams chose their alliance partner team to compete with in the elimination rounds. The Turning Point game has very specific ways to score points. In this game their robot had to flip caps to their color, turn flags to their color, raise caps with their color on top to the top of posts, and park on their color in order to score. Each match consists of red and blue alliance partners competing against each other. In the ranking qualifying matches, alliance partners are randomly selected for each team. Each team then plays in a set number of ranking qualifying matches. Once the ranking matches are complete, the top ranking teams have the privilege of choosing their alliance partner for the final elimination matches. Each match lasts only two minutes. The first 15 seconds is an autonomous portion of the game, where student-written computer programs are run to score as many points as possible. The alliance with the highest score during “autonomous” are granted the autonomous points. Then there are 1 minute and 45 seconds of driver-controlled competition. This portion is both offensive and defensive with the ultimate goal of scoring the highest number of points in your alliance color. The alliance team with the highest points wins the match. On Saturday, Silver Lake Team 2364B was ranked 4th and they were chosen by the 3rd ranked team from North Andover to be their alliance partner. Students from Silver Lake designed their robot to flip the caps, turn the flags, place caps on the posts and park on the platforms. Each Silver Lake Team has students who worked primarily on the robot design, others who worked primarily on the programming, and some who were involved in both. This year, VEX introduced a new Robot platform, V5, with a smart brain and smart controller that required the use of a new programming language C++. “Silver Lake didn’t receive their new V5 kit until January 3. Students on Team 2364B built a new V5 robot and learned the new programming language in less than a month,” said a proud Julie Walker, club advisor. Congratulations, teams, for an outstanding performance! Silver Lake Middle School offers Automation and Robotics (AR) to 7th graders as an elective. AR is a Project Lead The Way (PLTW) course that utilizes VEX robotics for mechanical builds and automation through programming using RobotC.